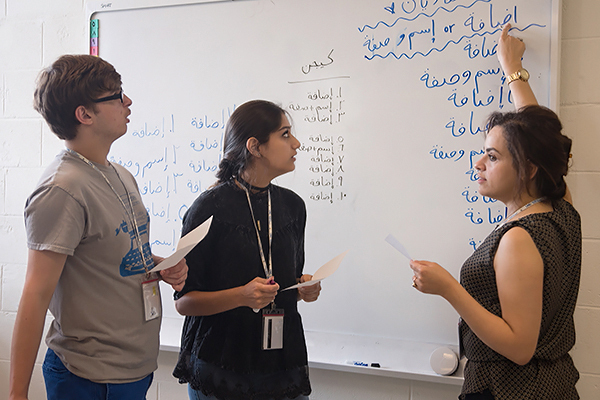 Professor Juman Al Bukhari teaches Arabic to high school students Keegan McCarthy, left, and Ana Ghafarian at the Federal Service Language Academy. A group of 72 highly-motivated teenagers on the University of North Georgia’s (UNG) Dahlonega Campus who want to learn a foreign language beyond the traditional classroom textbook instruction have come to learn at the Federal Service Language Academy (FSLA), a nationally-recognized, high-quality language program offering seven languages, including Arabic, Chinese and Russian. Since the launch of the program in 2011, more than 600 high school students have taken the three-week course. A typical FSLA day begins at 6 a.m. Classes start at 9 a.m. and run until 5 p.m. After dinner, students have cultural and language-related activities and study time until lights out at 10 p.m. There is no unsupervised free time. International Projects Coordinator Lacie Warren, who works in UNG's Center for Global Engagement, is the FLSA manager and says students from all across the country—and the world—come to learn at FSLA for its low-stress and high-quality environment. "Our students receive a totally immersive experience no matter what language they choose," Warren said. "We don't have them do 'busy work' like reading a textbook in class. The students are in class for seven hours a day; the instructors have to be really creative, to keep them engaged or otherwise they'll lose the interest of the students." While there is some studying from language worksheets, most of the instruction focuses on oral communication, learning how to speak in basic language conversation, as well as interactive games and learning more about the culture of the people of the language they study. At the end of the three weeks students are given an online assessment on listening and speaking, and could earn Georgia Public School Carnegie Units for successfully completing a level I or II foreign language course. Warren said most of the students have a desire to serve in government in a multitude of roles where a second (or more) language is essential, or as translators in either the public or private sector. Some students take a particular language for personal reasons, such as having been adopted from another country or because of a cultural heritage. Keegan McCarthy, a 15-year-old high school junior, is studying Arabic along with nine other students. He says he's been interested in languages all of his life, but narrowed his focus to Arabic during his freshman year at the Center for Creative Arts, a dedicated fine art magnet school for students in grades 6-12 in Chattanooga, Tennessee. This is his first time at FSLA. By the fourth day of class McCarthy says the pace of learning is nearing breakneck speed, but most all of the students have kept pace. "We know all the vowels, consonants, and about half the Arabic alphabet," he said. "It's a really hard language to learn, but we have a lot of study time in the evenings where we work within our group." McCarthy plans to pursue a degree in international studies and he says his "dream job" is to work as a service officer in the diplomatic corps in a Middle Eastern country, preferably Jordan. "I chose to study Arabic because I feel it's very important to know it, because it will help us advocate our ideas to [Arabic-speaking countries] and we will understand them better as well. Diplomacy is needed now more than ever, and [learning Arabic] will better serve our communicating among nations. In high school most of the students want to study Spanish, so it's exciting to be surrounded by my peers who want to learn a language not taught in my high school." Global opportunities are available to UNG students, faculty and staff through a variety of international partnerships, exchanges and study abroad programs. 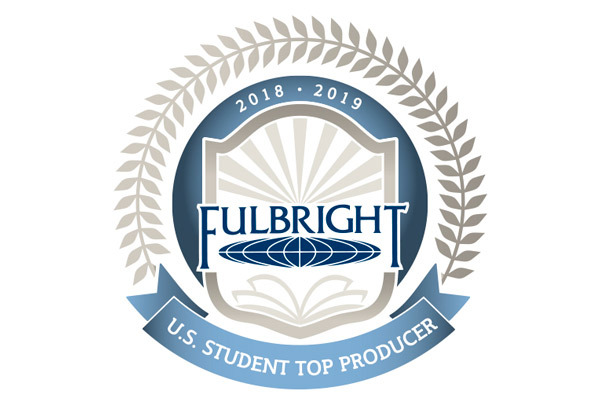 UNG also offers specialized global opportunities for students in the Corps of Cadets, including federally funded programs such as Project Global Officer, Chinese Language Flagship and UNG's Language Training Center.